I'd heard of white buffalos and that they were considered sacred. I know I've had a preference for white goats. I had no idea that there were other animals who could appear in the white and also be considered sacred. But that's what I learned while readng White Spirit Animals: Prophets of Change. If you have a feeling for animals, then you'll enjoy this exploration of these special critters. There are several features that makes this book unique. One is that the author introduces us to the significant humans who have pioneered in the field of animal consciousness, by which I mean communicating with the animals to realize their particular perspective concerning life on planet Earth. Secondly, we are introduced to animal telepathy and intuitive, inter-species communication. Third, but not last, we gain so much by being in the company of the author, someone who from an early age took a devout interest in the emotional and spiritual life of animals and dedicated herself to learning the art of animal communication. The book is truly a work of love. I may be an animal person. At a party, I notice right away any dogs or cats. I seem to feel more comfortabe getting to know them than I am approaching the unfamiliar humans that are more numerous, and speak English. I wouldn't say I was an animal communicator, I'm much too impatient for that, but I value the idea of it, and have spent quite a bit of time practicing having a heart connection with the animal to see how it responds. My little experiments give me the basis for believing what I am reading in this book. Much of the information about the animals comes from the critters themselves, communicated directly, intuitively, to the human reporters. Read how the author practiced "dream incubation" as part of her program to establish intuitive communication with a particular animal species. She kept a record of these dreams, of course, and her sharing of methods may inspire you to some of your own experiments. A pure heart seems essential, as well as the intention to follow through, or put into practice the wisdom gained. Also, I should warn you, that along with the inspiring stories that will excite your spirit, learning from the animals about the pain, degradation, and other horrors we humans create for the animals will be quite depressing. The silver lining is that experiencing the level of compassionate forgiveness the animals expressed, unequaled in the humans except maybe with the Amish, may birth a new spark of hope within you. 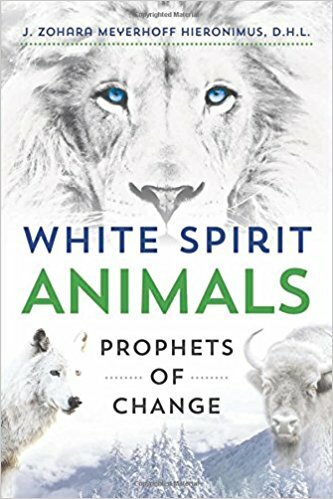 To explore White Spirit Animals: Prophets of Change on Amazon.com, click here!